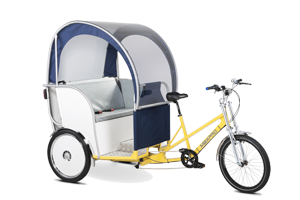 At Maxpro we have been manufacturing our pedicabs and rickshaws for more then 10 years. During this time we developed our pedicabs to perfection making them definetly one of the best fleet rickshaws. All Maxpro trikes are used by pedicab operators worlwide. Both Ecotaxi and EcoPromo are riders, and operator first choice. Getting Maxpro you can't go wrong with your decision. All Maxpro tricycles have a modular design, this means that you can convert Ecotaxi to EcoPromo or even to a EcoCargo trike within literally few minutes. This gives you full flexibility of the services you can offer. We have a range of standard colors which you can choose from such as block, white, red, blue, orange, yellow or silver and these colors are available for quick orders. At Maxpro you can also choose almost any chassis colour you like. We offer a wide range of colors from the RAL pallet and most of these colors are available. 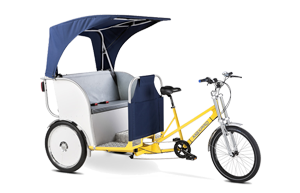 Maxpro pedicab rickshaws are very well thought through and require minimum of maintenance. In case of the servicing need there is an easy access to all components which save you time and hassle of replacing the parts. All our components are available through our online shop were you can easily order all parts. We ship parts worlwide with DHL and UPS which means you get your parts quickly and on time.